Almost 18 million people in the United States enjoy a game of tennis on a regular basis. Adults are not the only ones who enjoy this popular sport. When First Lady Michelle Obama held the “Let’s Move” tennis youth program, there were 226,000 kids in the United States who participated in the event. The number of children between the ages of six and 11 playing tennis is also increasing by 13% each year, and even younger children are now turning toward this game as a sport and a way to stay physically active. With over 10,000 tennis courts specifically made to accommodate children and a rapid increase that offers tennis programs for children aged ten years and younger, a lot of parents are now trying to get their children “into the game.” With short attention spans and an urge to quickly switch to another activity when the current game gets tired, it can be a little harder to help a child learn the game of tennis. Not being able to hit the ball can also be detrimental for a child. With some games and, of course, tennis drills for kids, you can help them get the hang of things, and they will improve in no time at all. It is a good idea to start with some warm-ups, as these help with getting the blood flowing and improving the hand-eye coordination of your child. There are different types of warm-ups that you can introduce your kid to. Running the lines is a particularly popular way to get them to do some warm-ups, while also introducing them to the various lines that are present on a tennis court. This basic movement drill shows the importance of footwork in tennis at an early age. 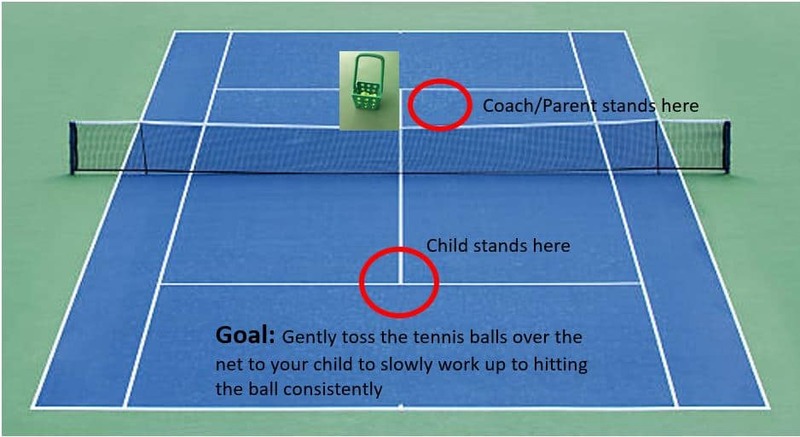 Get your kid to start at the net post’s far-right position – ask them to place one of their hands on the net. They would then start with backpedaling toward the baseline, then sidestep to their left toward the court’s singles sideline. Jog toward the net and touch it, then backpedal toward the court’s service line. You can make things a little more complicated as your kid gets better at the activity. Once warm-ups are done, it is most ideal to start with hand-eye coordination. There are a couple of ways that you can help your kid build up their hand-eye coordination. A lot of people tend to start with The Frying Pan technique, followed by dribbles. The frying pan is really similar to dribbles. These activities should be repeated frequently in order to help your kid improve their skills. The frying pan drill is a easy game to teach kids and it helps them develop their racquet control. With the frying pan technique, the tennis racquet should be in your kid’s dominant hand and should be held in a similar way as they would hold a frying pan. The tennis ball should then be placed on top of the racquet’s strings. 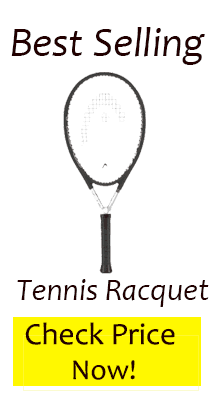 The racquet is then moved in upward and downward directions to get the ball to start bouncing on the racquet. At first, the kid may only be able to keep it going for 1 or 2 times. Make it a competition! See who can get the most bounces on their racquet. The two most important shots in tennis: the forehand and backhand. Every practice you should go over how to hit these shots and play some games and drills to improve them. Here’s two of the most effective drills below. Stand in front of your kid and take a few steps toward one side. Keep a basket of tennis balls ready. Explain to your kid the different grips involved with forehands, as well as backhands. Show them how they should ideally hit the ball with these grip techniques and then start to throw the balls toward them, allowing them to hit the ball with forehands first, and then a couple of backhand techniques. Once your child gets the basics of the forehand and backhand, you can then move onto accuracy. The easiest way to help train accuracy is with a variant of the above tennis drill. 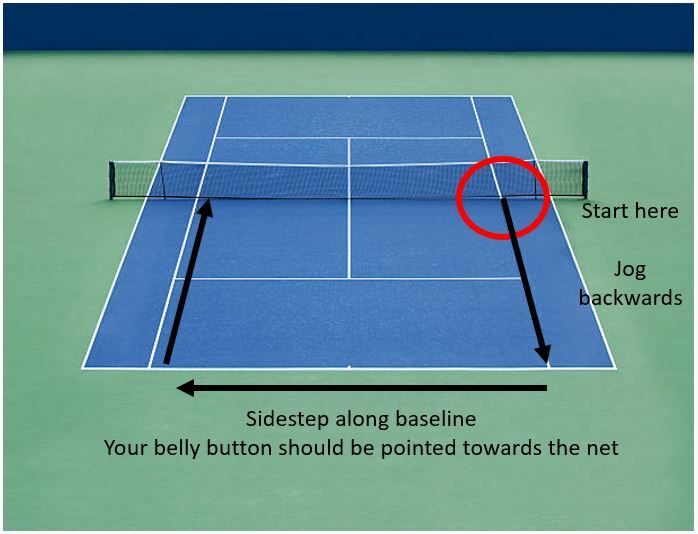 In this drill you want the same general setup, with you standing on the opposite side of the tennis net from your child. You also want to place two cones at the center of each service box on your side of the court. This will give the children targets to aim for. Remember, they’re children! Bribe them with treats or promises of ice cream afterwards if they hit the cones more than 5 times (adjust according to skill level)! Another set of tennis drills for kids would be volleys. These are really simple to perform and are great for getting your child more involved in the activity while building their skills and confidence at the same time. 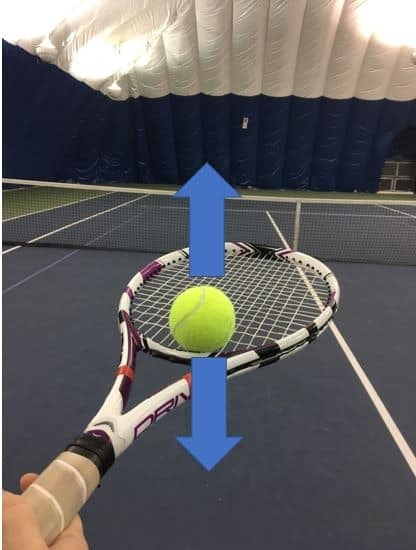 Volleys involve ensuring the ball is hit back to the other side before it hits the ground; thus preventing the ball from bouncing before landing a hit. While it may be difficult at first to teach a kid to play tennis, there are many strategies that you can use to make the experience fun and less intense for them. 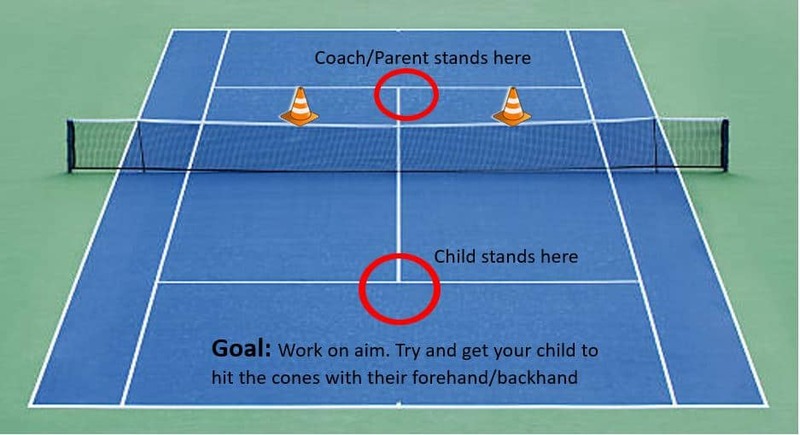 These tennis drills for kids are all great if you are just starting to teach your child to play tennis. Always start with the basics and work your way up. This way, your kid won’t lose interest and won’t become frustrated when that ball keeps missing their racket.